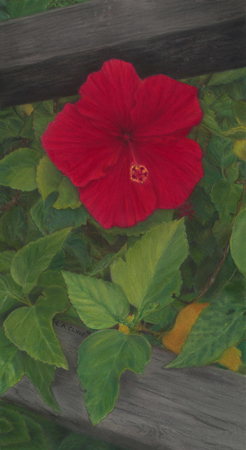 “Hidden Beauty” reveals a beautiful bold red Hibiscus flower that by God’s grace had the protection of the fence and the surrounding leaves to bloom to its fullest emulating the original pastel painting. Stroke by stroke I hand painted this canvas Archival Digital Fine Art of “Hidden Beauty” with Oil as it became a unique original of its own. Then I spray the art with a clear archival spray for UV protection. The art comes framed with a double golden wooden frames with soft black detail that keeps all the colors looking bold. 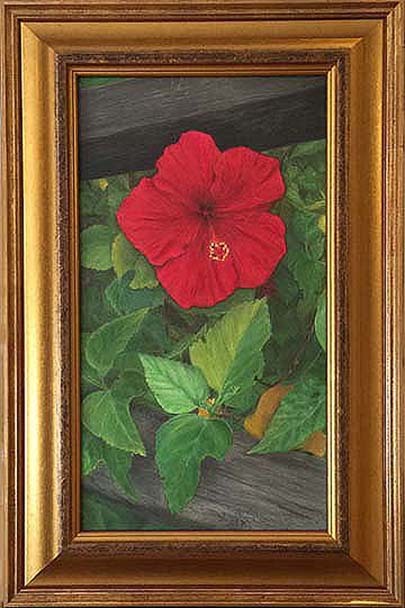 This framed “Hidden Beauty” measures 15 1/2″ X 23 3/8″. There is an edition of 2 hand painted archival art using this frame including a Certificate of Authenticity. One like this beautiful “Hidden Beauty” was exhibited at the Agora Gallery in New York and in Neiman Marcus Fort Lauderdale at a Trend Event and Artist Showing. Personal attention is what this site was built for so if you need more information about this or any other art I create please call me directly.